It's like having your ex-wife's name tattooed across your face. 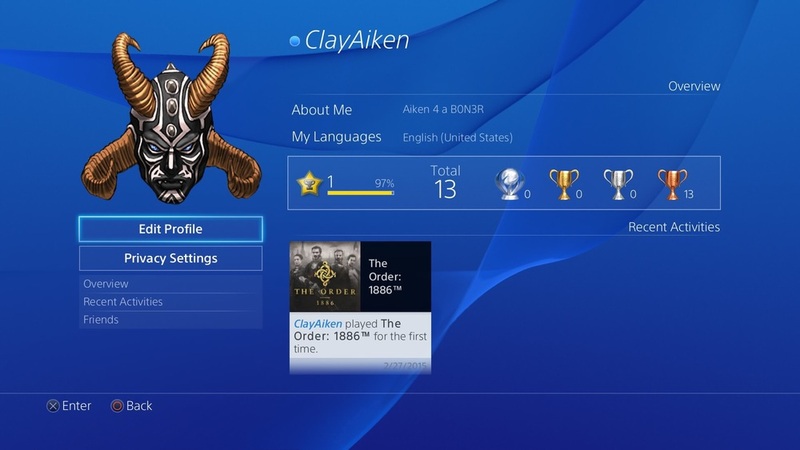 Changing a PSN name should be a standard feature. The fact that it's not possible yet in 2015 is completely unacceptable. It would be one thing if a PSN account was nothing more than an online handle, but when you have the possibility of attaching thousands of dollars in purchases, there is really no excuse. Nearly a decade after creating their account, nobody should have to start their trophy collection all over again because it took them too long to realize that xxLinKnPaRKxx is a terrible name. In limbo, where your games will remain for hours. Sometimes download speeds from PSN are adequate, but often they're not. Even if you have a 20MB/s download speed, PSN often hovers around 5MB/s. For some reason download speeds increase when you put the system into sleep mode, but in an era where huge day- one patches are the norm, slow download speeds can really ruin a launch day. The Playstation Store has seen quite a few overhauls in its existence, but I still find it to be a mostly frustrating experience. Specific items are often difficult to find due to an abysmal search system and product tiles often take way too long to display and sometimes don’t load at all. Even something as simple as finding out which Playstation Plus games are free via cross-buy becomes an exercise in absurdity. Only 2 years into the PS4's life and I've seen this a lot. Cloud storage has become a vital part of the console ecosystem. If you want to continue your progress on a different system, or recover saves from a damaged console, downloading from the cloud is usually the most convenient option. This works perfectly on PSN, but the problem is the absurdly small amount of space available. One measly gigabyte is nowhere even close to enough space for upwards of 9 years of saves spanning across three systems. Within a few months of using the service, my Playstation 4 notification menu is constantly filled with the shocking news that all of my saves failed to upload to online storage. For a network that (in a roundabout way) charges a monthly fee, 1GB is insulting, especially considering the growing amount of game saves in the 100MB range..
Amazon Instant Video is not a game, PS4. The most frustrating thing about PSN is the download list. This has driven me nuts for years and I'm sure many others feel the same. Re-downloading purchases is one of the more infuriating experiences I've ever had. There’s no way to even search your download list, and literally everything is grouped together. Themes, avatars, demos, betas, DLC and games all occupy the same space in a giant list that takes ages to load. The best part about it is once you select an item to download, you get to start at the beginning of the list all over again! Well, surely all of the content is in the order it was purchased right? Think again! Every time your Playstation Plus subscription renews, all of those games get pushed back to the top again. A simple search function/filter option would alleviate most of the problem, and it seems absolutely crazy that it hasn't been implemented yet. Now roughly two years into the Playstation 4, my library list is already cluttered with betas, titles with add-ons that can’t be deleted, and a wide array of games that aren’t even on the system. C’mon. Don't get me wrong, I love Playstation Network and it does a lot of things well, but such basic elements of it just need to be addressed. Going digital would be so much more appealing if the interface wan't such a chore to navigate. It is worth noting that the network has changed for the better since the Playstation 3, but now that we’re paying for it’s services, we can only hope Sony speeds up the progress. These are five things I'd do to help bring Playstation Network up to speed, leave a comment or find us on Twitter @GameAwry with some of your own.